If you follow me on Instagram you probably know by now that salmon is one of my absolute favourite fishes. I just love how versatile it is and how quick it is to make. A simple piece of it can be turned into a healthy dish in less than 10 minutes and as you know that’s what I’m all about. Quick foods. I’m a big fan of the freshness mango can bring to a hot dish, especially in the summer, last year I was obsessed with my mango and chilli dressing on grilled chicken salads (click here for that recipe). It’s sweet juiciness pairs wonderfully with grilled fish and chicken. In a bowl mix olive oil with the crushed garlic and season with some chilli flakes, lime juice, salt and pepper. Use this mixture to season your salmon and leave it in the mixture while you prepare your salsa. Dice your mango, pepper, tomato and onions and combine it in a bowl along with chopped coriander. Season with olive oil, chilli flakes, the zest and juice of 1 lime, salt and pepper. You can add more lime depending on your preference. Using a griddle pan grill the salmon on both sides until it is cooked through. 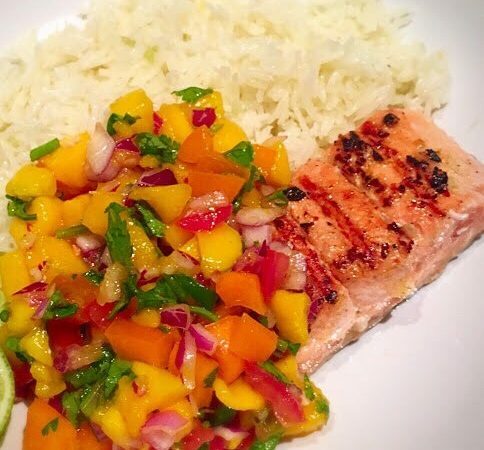 Serve the salmon with the salsa and some rice. I personally like it with some basmati rice cooked with lemon and coriander. As always I love to know if you tried any of my dishes so please to tag me on Instagram or tweet me!